Hey there, so it's been a little while hasn't it? But I'm back today with the first post in a new series here on the SunshineSarahxo which aims to feature all of my favourite independent coffee shops and cafes in here in Harrogate. Just like I love supporting small businesses online, I also love doing the same in person by shopping small, supporting our high street and not giving my money to the big boys like Starbucks, Cafe Nero and Costa; instead heading to the smaller cafes/coffee shops where you're much more likely to find a warmer reception, friendlier service and some tasty handmade treats! 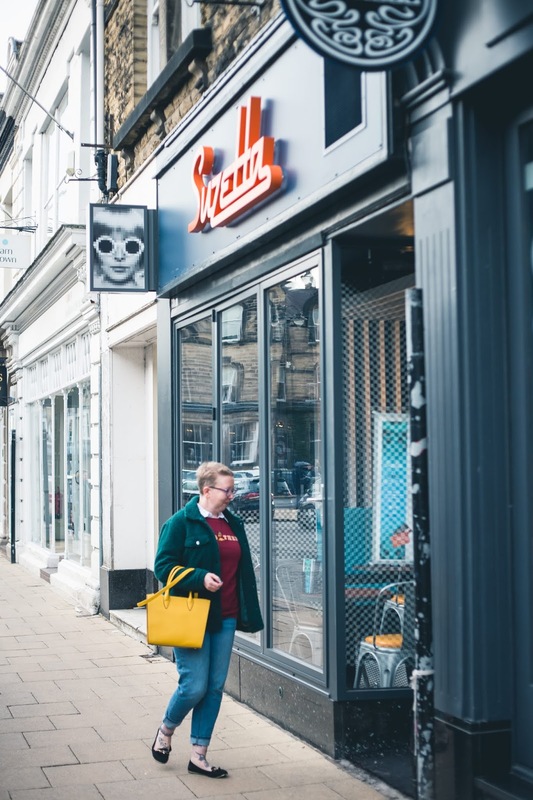 There are quite a few here in Harrogate so I feel very lucky to be able to step out of my door and instantly find some of the best coffee and tea around. Getting to know the people who work there and feeling like part of the community really does make me feel connected to my new town and not so isolated which really helps when you are still feeling like a newcomer after 2 and a half years! So, with this new series I am going to show you around my favourites and perhaps persuade you to do the same in your home town or city. Today I'm going to start with one of my favourites and the only pancake shop in Harrogate - Suzetta! Suzetta's was once called Crepes and Creams and was quite a small space in comparison to how it is now, despite the fact there isn't any more space than there was before! They've just re-jigged the layout to include more tables and a much more open layout, allowing a light and airy feel to flow around the cafe. The massive windows at the front open up in warm weather, allowing you to enjoy an almost al fresco feel whilst dining. 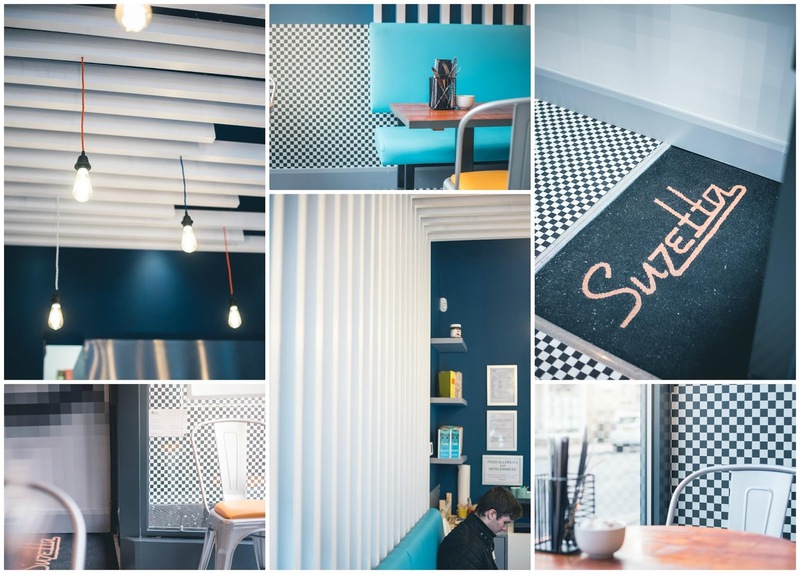 The eclectic design with monochrome flooring and vivid blue paint with contrasting white boarding and ceiling adds a certain je ne sais quoi to the space. 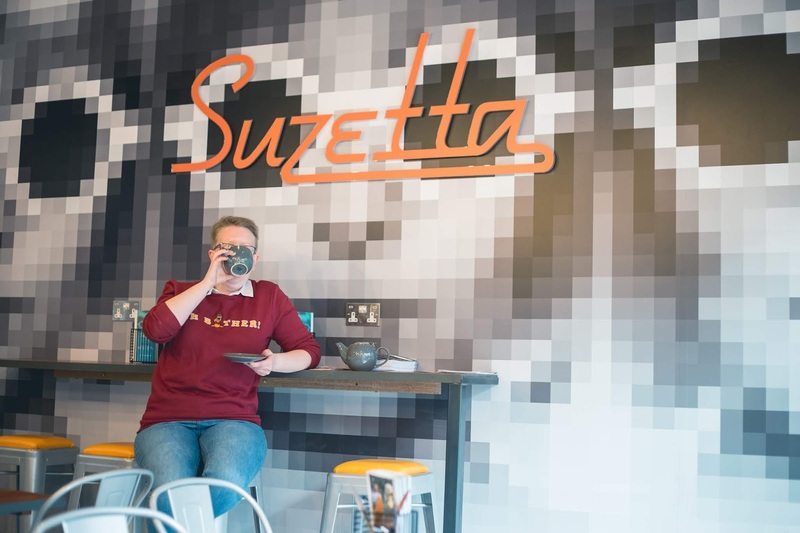 Along one wall they have a pixilated photo of their new logo with Suzetta in large orange writing makes for the perfect Instagram shot! Andi and James have managed to bring a touch of class to Harrogate's high street with Suzetta's, being the only pancake shop in town could be difficult and we all know what tough times independents (and even some big names) shops are facing out there so it's vitally important to go out there and support them but with that being said, the way they've managed to put themselves on the map and integrate themselves with the local community surely means they're here to stay? I for one really hope so! 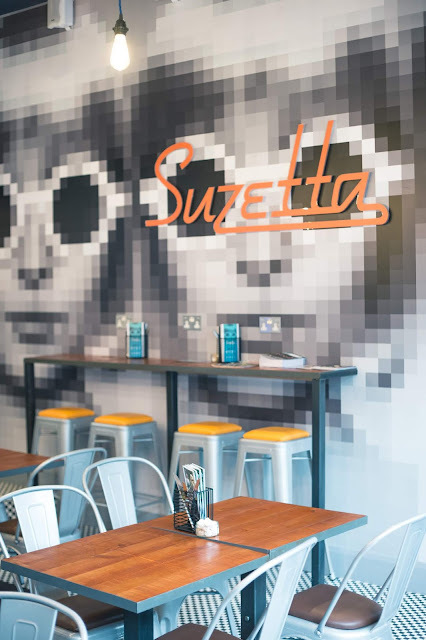 What makes Suzetta stand out from every other cafe/eatery in Harrogate, apart from the decor, is the friendly vibe from the owners and the fact they're unique amongest all of the other restaurants, cafes and coffee shops which we're so lucky to have here. Yes you could argue that there are too many of them and it's a surefire way to see more closures but I'd argue against that and say that because there's so much choice you could eat out every day of the week and not have the same cuisine twice! Another reason why I love Suzetta's is because you can have any fillings you desire, no matter how odd! Marmite and cheese? Strawberry jam and banana? Goat's cheese and chocolate? (okay that last one IS a bit weird!) 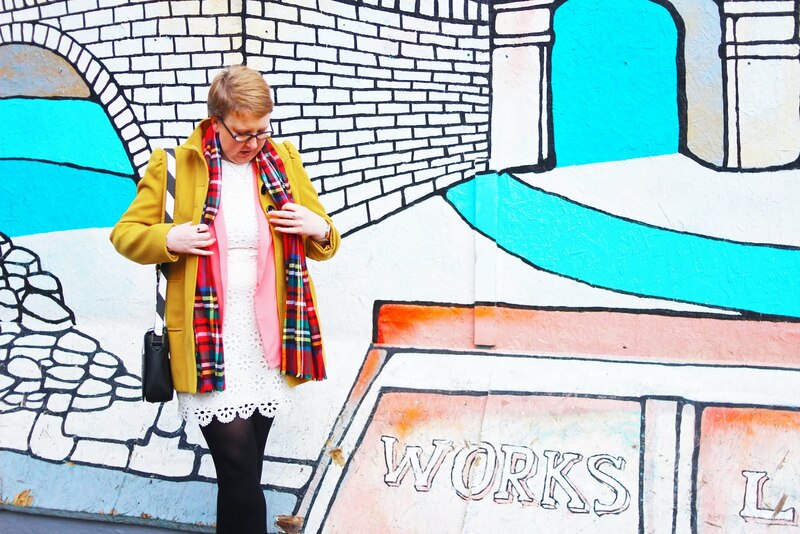 Andi will happily create it for you! 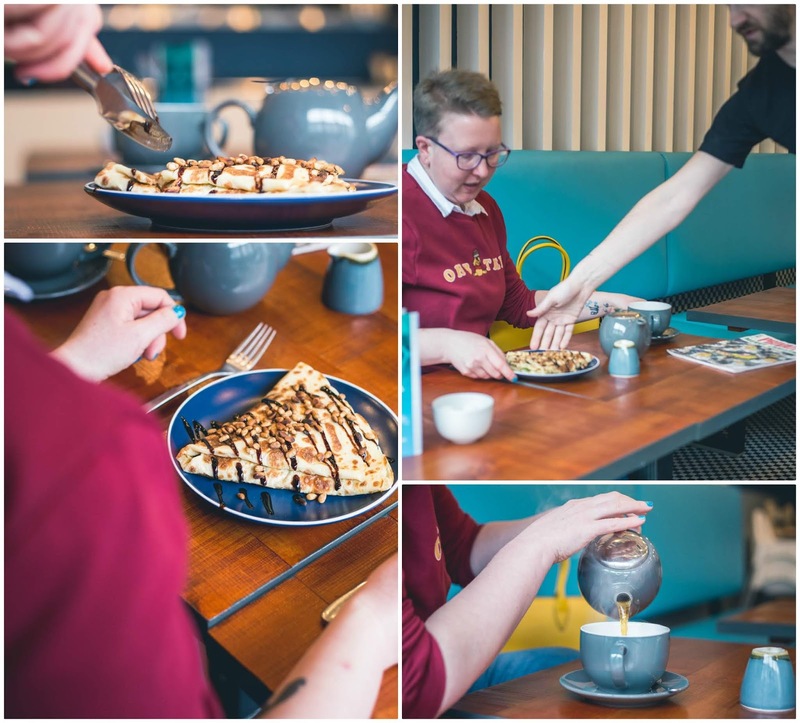 This uniqueness sets them apart from other cafes who just happen to offer pancakes, to have one place which only sells pancakes means they can ensure that every single one is given the love and care they so rightly deserve. This means every customer is left with happy bellies and wanting to come back for more. With it's location on Albert Street just next door to Pizza Express, and moments away from both the train and bus stations, there's no better place to stop off for pre-trip coffee, an after work pancake or lunch with the girls after a day's shopping. 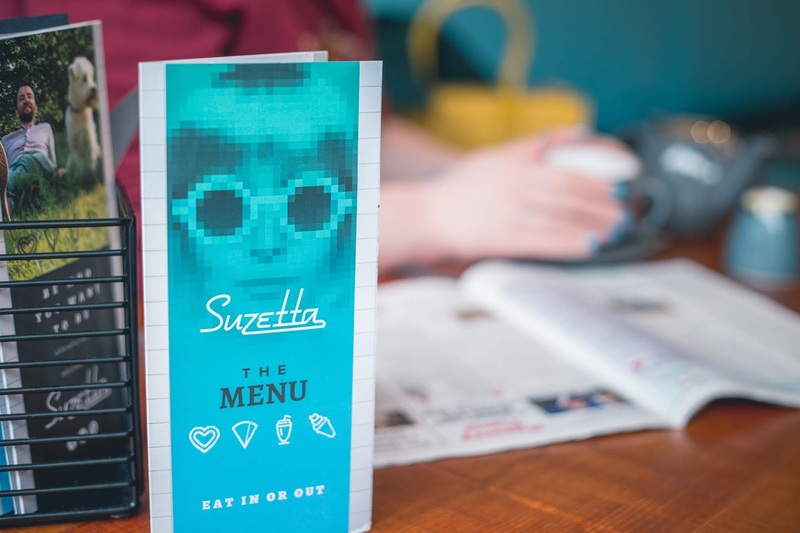 I have written before about my social anxiety and being unable to go out to coffee shops alone since moving to my new hometown but actually I instantly felt so welcomed at Suzetta's that it's now one of my favourite places. Andi and James are so friendly that I'm instantly at ease whenever I enter and I can forget my worries and just concentrate on enjoying a delicious vegan pancake whilst catching up on all the latest news! Did I mention that Suzetta's also cater for all your dietary needs? 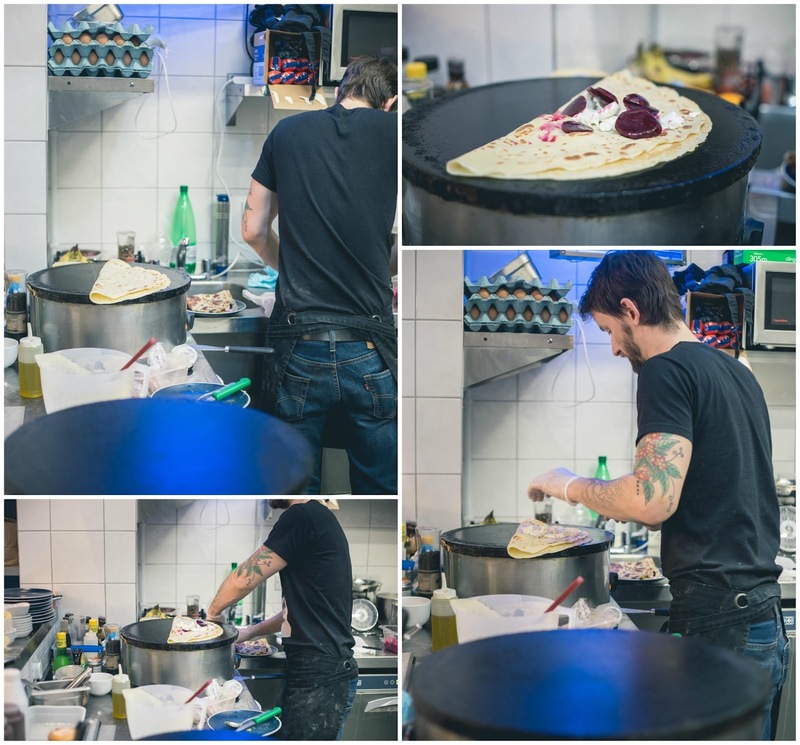 Vegan, gluten free, vegetarian, whatever your needs are they can whip up a pancake to suit. Having recently gone vegan myself, I now needn't worry about missing out on enjoying pancakes as they're all made with buckwheat flour and egg replacements all leading to one of the most delicious pancakes I've ever tasted. Thanks Andi! So if you're in the area then I highly recommened a visit to Suzetta's, if like me, you believe pancakes should be enjoyed more than once a year! 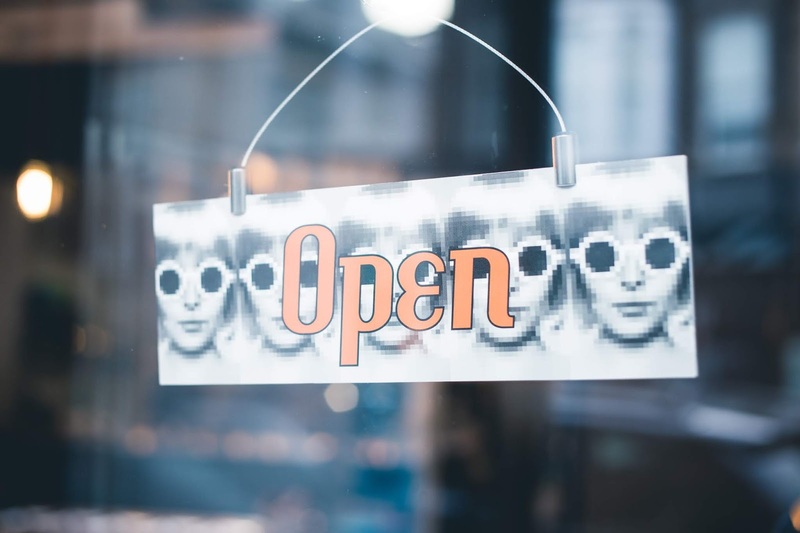 The new look is sure to attract new customers and keep old comes coming back time and again. I'm so happy to be celebrating just how wonderful Suzetta's is, they've truly cornered the market in bringing 'create your own' pancakes to Harrogate. No matter how many pancakes you've had in your life there's always room for more! 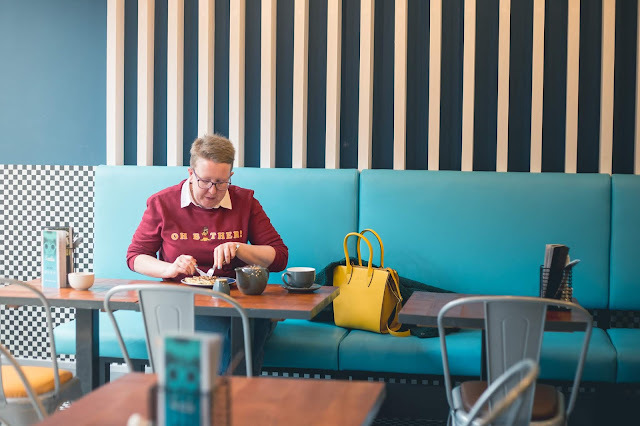 I'm going to be bringing you more reviews of all the independent coffee shops and cafes in Harrogate because I really do enjoy visiting them and would really love to spread the word of how amazing they are, so stay tuned to find out which one I'll be covering next! *Photos all taken and supplied by Matt McCormick.